This article is about the city of Brahmanbaria in Bangladesh. For the upazila of Brahmanbaria, see Brahmanbaria Sadar Upazila. For the district of Brahmanbaria, see Brahmanbaria District. Brahmanbaria (Bengali: ব্রাহ্মণবাড়িয়া) is a historical city of Bangladesh. It is the capital of Brahmanbaria Sadar Upazila and Brahmanbaria District and second largest city after Comilla in eastern Bangladesh. 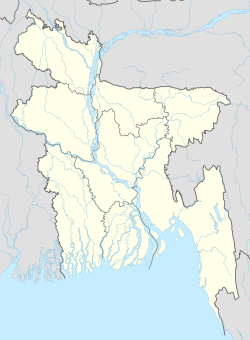 Brahmanbaria is one of the oldest municipalities in Bangladesh, and was established in 1769. Brahmanbaria was declared a district headquarters in 1984. Its municipality area has a population of 168,636 according to the 2011 Census. Brahmanbaria is famous for Titas Gas field, putul nach (doll dance), sweets items such as chanamukhi. It was a part of greater Comilla District until 1984. Brahmanbaria was given city status in 1984. The city boundaries contain Sadar Municipality, 12 Wards, 78 Mahallas, and 36 villages. Some of the rich and busy neighborhoods of Brahmanbaria main town. Brahmanbaria is located in the East-Central region of Bangladesh. Its nearby cities are Dhaka, Comilla, Narayanganj and Agartala. This city is in the bank of Titas River. Also there is Meghna River in the west of Brahmanbaria. The climate of Brahmanbaria is very similar to other cities of Bangladesh. During summer it is extremely hot. August is the hottest month and January is the coldest. Floods are a major concern for people in Brahmanbaria, as the city has suffered from flooding for four times in a decade. Tornados and the monsoon Kaalboishakhi jhor hit almost every year. Brahmanbaria has a tropical wet and dry climate. Allauddin Khan, A Bengali shorodi and multi-instrumentalist, composer of the 20th century in Indian classical music. Syed Shamsul Haque was a poet, novelist, writer and translator. Porshi is Khude Gaan Raaj winner, most successful modern Bangladeshi singer. Al Mahmud, poet, translator and writer. Brahmanbaria also produced actresses like Zakia Bari Momo ,who won LUX Channel I Superstar. Alamgir is evergreen actor of Cinema of Bangladesh. He start working in mid '80s and he is still an actor. Brahmanbaria has other people like Al Mahmud, Cricketer Mohammad Ashraful, Abdul Kadir and Syed Shamsul Haque who are a poets. Nawaab Syed Shamsul Huda was a leader of the Muslim League. Shakil Ahmed was the director general of Border guard Bangladesh, who had heavily secured the borders of Bangladesh. ^ "Area, Population and Literacy Rate by Paurashava −2001" (PDF). Bangladesh Bureau of Statistics. Archived from the original (PDF) on 27 March 2005. Retrieved 18 September 2009. ^ www.geopostcodes.com,. "ZIP Code database of Bangladesh". Geopostcodes.com. Retrieved 11 June 2008. ^ "Wikivoyage". Map Data OpenStreetMap. Retrieved 11 July 2011. ^ "Government Official Name". Local government in Bangladesh. ^ "NGA GeoNames Database". National Geospatial-Intelligence Agency. Retrieved 14 July 2008. ^ "National Web Portal of Bangladesh". Bangladesh National Web Portal. ^ "Population Census Wing, BBS". Archived from the original on 27 March 2005. Retrieved 10 November 2011. ^ Bangladesh Compendium of Environment Statistics. Bangladesh Bureau of Statistics, Statistics Division, Ministry of Planning, Government of the People's Republic of Bangladesh. 2009. ^ "Brahmanbaria, Bangladesh Travel Weather Averages (Worldweather)". Worldweatheronline. Retrieved 3 October 2015.